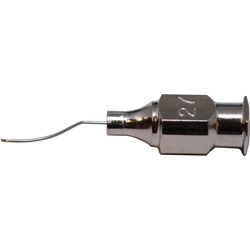 Reusable Cystotome Cannulas range from 25 gauge to 27 gauge with angled shafts that are 12mm from bend to tip. Cannulas have small cystotome sharp cutting edge tips and are irrigating. Overall length: 15mm.